Income disclosure statements help explain how much money It Works pays people enrolled with the company as Distributors. These are released by the company, and don’t tell they whole story. However, they can give some important information to help evaluate the business opportunity. In October 2018, It Works! still had not released a 2017 disclosure. It Works! makes an important note about all of the disclosures about income and expenses. Remember, none of the income disclosures should be thought of as profit, to get an idea of profit or take home pay you would need to subtract all expenses. It Works! mentions that these expenses can be pricey. Note that these figures do not represent a Distributor’s profit, as they do not consider expenses incurred by a Distributor in operation or promotion of his/her business. The [figures] refer to gross (total income before any expenses are deducted). The expenses a Distributor incurs in the operation of his or her It Works! business vary widely. Expenses for distributors can be several hundred or thousands of dollars annually. You should factor in estimated expenses when projecting potential profits. Such operating expenses could include advertising and promotional expenses, product sales, training, travel, telephone and Internet costs, business equipment and miscellaneous expenses. Who is buying and selling? The income disclosure says most Distributors received income in 2016. 6.48% of Distributors receive no income at all. The compensation plan lets us know how a Distributor can receive income: through retail sales, sponsoring distributors, and bonuses. For retail sales, “Commissions are paid to the enrolling Distributor on retail orders even if the enrolling Distributor is not commission qualified.” This includes commissions on retail orders for the Distributors own purchases. This helps to explain why most distributors (93.52%) are being paid something by It Works!. But, it’s hard to tell if most purchases are just by It Works! distributors (see bonus buying and inventory loading). Previous versions of the compensation plan explain that purchases of this type will be made in the distributors name. This is a red flag, a better system is to attribute sales to end customers. Also, this income only includes commissions made on these purchases, its not clear if the products sell for more than wholesale. This is a red flag. If markups were a significant part of the income for distributors, It Works! would want to share that opportunity. Distributors make up 78.73% of the Distributors with a monthly average paid is $51. Looking carefully, we see that the range paid is extremely wide with a high of over $10,000 and a low of $1. There is no information like percentiles, and how many distributors this data represents. It is impossible to tell if very many distributors actually receive the ‘average’ amount. For example, if there are 2 distributors and one is making $10k and one is making $1 the “average” would be about $5k. In order to get to about $51 average with only 1 person making $10k there would need to be about 200 people making $1. This means a lot of people are making very little money. The wide ranges, make the averages pretty misleading. Instead, It Works! could report on the top and low percentiles, and other more transparent information. Most people selling It Works fall in the first rank and the first three cover over 95% of distributors. Emerald, Diamond, Double Diamond, Triple Diamond, Presidential Diamond and higher ranks account for less than 5% of everyone. 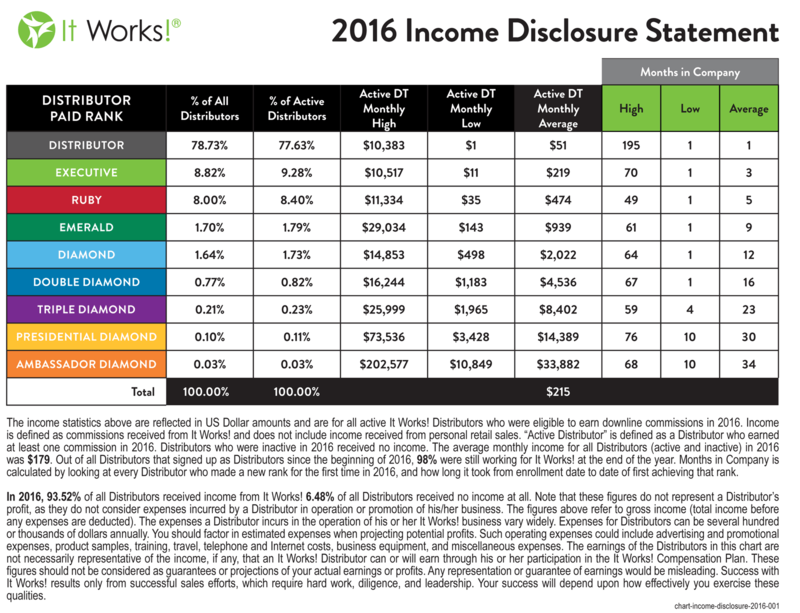 2016 Income Disclosure Statement from It Works! We see that for 78.73% of Distributors have a monthly low of $1 and a high of $10.3k. Executives have a very similar range ($9-$10.5k) and represent around 9% of Distributors. Finally, Ruby also has a similar range ($35-$11.3k) The averages climb a bit between these ranks but its hard to tell what that actually means (see above) without more information. What about the higher ranks? Reaching the higher ranks is all about recruiting and having enrolled commission qualified Distributors. You can not reach higher levels without recruiting other members. This is a red flag. This means that significant income comes from recruiting other members into the network and rather than retail sales to customers outside the network. Climbing the ranks at It Works! In order to continue receiving commission checks based on the people that Distributors have recruited they must maintain their status as “commission qualified.” This means meeting a personal volume requirement to maintain eligibility for commissions based on rank. The wide ranges for monthly payments make it impossible to know what payments Distributors generally receive. A fair thing to say is that 95% of distributors received between $1-$11.3k in commissions per month. We can also conclude most received a lot less than $51 per month (in order to bring the averages down). In this case, the averages are simply misleading. Finally, with hundreds or even thousands of dollars in expenses it’s hard to image this leaves any profit. It’s likely most of these distributors end up losing money selling It Works!. No affiliation with It Works! Global. Please contact us with corrections or questions.